This week’s SJT word, compliments of M. Simon, one of the SJT community members is, Present. Present as in a gift. Present as in to give. Present as in I am here, in attendance. Here goes a reflection weaving all three meanings. As a fellow student, as well as a teacher, I have heard my share of “Here’s” and “Present’s” in response to attendance roll calls. Until I began noodling for this post, I never had considered the difference between those two responses in a spiritual journey sense, in the sense that, as we journey through life on this Earth, in what we might consider God’s living and learning laboratory, school or classroom; we accept or reject His teaching, with Him and His delegated teachers. We can be truant. We can stay after for remedial assistance. We can be good students or not. The gift of being present to God is really a gift to ourselves, since we are actively open to God’s action in our lives. When we give the gift of ourselves to God, we come to realize that God has been gifting Himself to us. He has been loving us into loving Him, teaching us to be good disciples, good students. What a great God we serve! He Who needs nothing or no one outside Himself not only presents Himself to us, but He delights when we present ourselves to Him. As a social studies teacher, I regularly gave students the essay questions ahead of time. Students thought it was too good to be true. I assured them not only were the questions I gave them truly “those” questions that would appear on the test, but that they would have their choice of answering a set number from among those questions. I told students that I believed testing was meant to be a learning experience. Since I was testing them on the most important concepts, I wanted them to reflect on those concepts ahead of time. In return, I told students my expectations were elevated. No “bulling me.” Only one student tried snowing me. Every other student I can honestly say wrote a thoughtful response to each question chosen to answer. Now that I am much further along in my spiritual journey than I was when I started teaching, in retrospect I wonder: subconsciously, did I model my testing technique after the Lord’s? Did I take His technique of giving the test questions ahead of time to ramp up the results? No excuses. No: “I studied the wrong thing.” No: “I knew everything but what you asked me about.” No excuses. The Lord has given us the same challenge and opportunity. He has raised the bar. Being present to Him provides the information, the modeling, the help we need to make it over the hurdle. If the final exam were a playground game, this isn’t the “Limbo” dance…how low can you go?—no, this is how high can you go to meeting the Lord’s expectations of loving Him and neighbor. As I take my turn with practice runs, training to make it higher and higher over the hurdle, thanks for giving me a boost! Thanks for being present to me in the journey. Thanks for giving the gift of your faith, hope, and love! Thanks for revealing His Presence to me. God bless you, and thank you so very much! Being present is an active response, not like just being here. Interesting. I hadn’t thought of this before, but it’s so true. Our presence is a gift as is God’s presence. Thanks for writing today. I got so many different perspectives on my OLW. So interesting, isn’t it, that the same OLW evokes so many different responses–as different as we are! 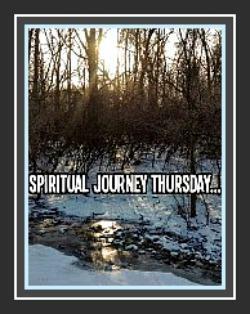 Thank you for inspiring today’s focus word as we reflect on our spiritual journeys. God bless you! Thanks for taking time to read and to respond to my reflections. God bless you! I love your comparison of being present to a sort of open book test. In a way I always thought those were harder than the other kind when I was in school because there were no excuses. I like the fact, too, that you’re seeing progress. I know your Teacher is proud of you! Thank you! What an affirming (surprising!) last comment! Please, God, let that be true! …Thank you, as always, for find something redeeming to connect with and to highlight. I appreciate your sharing your wisdom in response to the post. God bless you, and thank you! “…actively open to God’s action in our lives.” Love this reflection on three ways to look at being present. Thank you so very much for taking time to read the post and to share your comments. It’s always very gratifying when a reflection resonates with someone. Thank you! Every blessing! I love that our presence is our gift to Him. He created everything and is mighty, powerful, and wonderful. It amazes me that He loves us so much. Amen! Our God is amazing! Thank you for taking time to read the reflection and to add your affirmation! God bless you! Thank YOU, so very much, for taking time to read and respond to the reflection. I appreciate your sharing how the piece resonated with you; I’m very happy that you found a take-away message. God bless you for being present on this week’s shared journey! What a great analogy – God’s Word and an open-book test! I also loved your distinction between being “here” and being “present”. In addition, I loved the exploration of the multiple meanings of “present”. So much to ponder and take away from this post. Wonderful! You are wonderful for providing the place, guidance, and inspiration for SJT posts! Thank you, and thank you for taking time to read the post and to affirm all the ways that you connected with the reflection. God bless you for giving me more to ponder and to take away from your feedback! Thank you!